We have prepared a list of technical terms used on these pages and in our other product documentation. We realise that some of these terms are used differently in other countries, and in other contexts – however, this is the way we use them, after many years in the business! Talkback or Intercom? Starting with the big question! We use 'intercom' to mean a system where all stations (panels, etc.) have roughly equal status and can communicate freely with each other. We use 'talkback' to describe a system where some stations can have a higher higher priority than other stations or signals, and some channels may be inputs only and others outputs only. Hopefully some of these special functions will be explained further down the page! Historically, we have read, 'talkback' has it's origins in sound recording studios, where the producer has a switch on his console allowing him to 'talk back' to the performers in the studio. As the studio would be full of live microphones, it was easy for the performers to talk to the producer. Reverse Talkback (RTB) Logically following from the recording studio example, this is 'talk back' from the performer to the producer. In television studio communications, this is extended to include 'talk back' from anyone who would normally just receive instructions, cameramen for example. Production Talkback (PTB) (Also known as “Omni” talkback in some circles) This is 'talk back' from the production area to everyone else (the opposite to RTB, we suppose). In our systems, this function is usually performed by the 'All' button. As this audio route is almost always live, our panels usually provide an independent volume control (usually labelled 'Aux', as it can be configured for other functions). Engineering Talkback (ETB) Usually only used in the context of 'talk back' with cameras, this circuit is separate from PTB, allowing the camera operators and vision engineers an independent route for conversation that doesn't concern production (also, often used for conversation between cameras). Not all cameras are provided with enough audio pathways to do this – our systems can all be configured to work with separate PTB/ETB or combined talkback. Ring Intercom Intercom system where everybody talks and listens on the same circuit – the 'ring', sometimes referred to as a 'Partyline' system. This system is common in the USA and in theatre systems, but increasingly being replaced by switching/matrix systems. Most of our systems can interface with ring intercom systems (see 2-Wire and Belt Pack, below). Interrupted Foldback (IFB) Another term that has historical links with sound recording studios. In recording, or live performance, foldback is the means of allowing the performers to hear themselves – so 'interrupted' foldback simply means that talkback from somewhere else momentarily replaces the normal foldback. In most systems, the existing foldback (described as 'Standing Feed' in our product descriptions) is simply muted, but in more sophisticated setups, the foldback reduces to a set level – so it can still be heard. 4-Wire A simple shorthand for balanced line-level input and output – 2 wires for the input and 2 wires for the output. 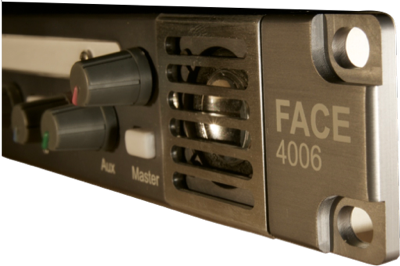 In talkback systems, 4-wire is a very versatile interface, with many uses. Often, the input and the output are used for talkback to/from the same area, but not always. In IFB, normally the input is used for the 'standing feed' input to the output – this is often used for presenters who can be heard through the usual monitors, so don't need a reverse talkback path. Sometimes an output doesn't need an associated input connection, or an input doesn't need an output – in larger installations there can be a considerable difference in the numbers of inputs and outputs! 2-Wire A simple shorthand for a circuit where the input and the output are combined onto the same wires. This usually requires a fixed terminating resistance to the line and some form of bridge circuit to extract the input from the output. In the past, some camera intercom circuits were balanced 2-wire terminated in 600 Ohm – but it's a long time since we've seen that configuration! Other examples of 2-Wire circuits are ring intercom belt packs and telephone lines – although telephone line interfacing is beyond the scope of this article! Belt Pack Pretty much what it sounds like – a portable communications station worn on the belt. Usually these are wired 2-Wire units, but increasingly they are wireless units (again, beyond the scope of this piece). As well as various proprietary systems, there are two 'standards' for connecting 2-Wire belt packs – naturally, our systems are compatible with both! Simplest is the circuit used by manufacturers like Clearcom and ASL – using an XLR connector with a pin each for ground, power and audio (single ring, also with signalling on the same circuit). Slightly more complicated and versatile is the 'TW' circuit used by RTS – again using a single XLR connector, with a pin each for ground and two audio circuits (the power is also supplied over the same connections as the audio). Controls Talk to all, talk to slave panels 2-4, volume control for slave panels, talk to IFB 1-2, talk to all cameras, volume control for cameras, talk to main 2/4-wire, volume control for main 2/4-wire, talk to aux 2/4-wire, volume control for aux 2/4-wire and volume control for configurable aux input. Controls Talk to slave Panels 2-4, volume control for slave Panels, talk to cameras 1-8, volume control for cameras and volume control for configurable aux channel.